E-Clip’s Wi-Fi connectivity uses AirPlay 2 technology to provide an uncompressed, high-quality audio experience. E-Clip™ is the world’s first wireless headphone to use AirPlay technology. By using Wi-Fi and AirPlay 2 technology, E-Clip is able to provide the highest audio quality available for headphones. E-Clip is currently available for pre-order on Kickstarter with a $30,000 funding goal. E-Clip’s Wi-Fi connectivity uses AirPlay 2 technology to provide an uncompressed, high-quality audio experience. Other headphones, that use Bluetooth technology to stream audio, compress the music and diminish sound quality. By utilizing Wi-Fi connection to listen to music, users can stream uncompressed, crystal clear music with the best sound quality from any AirPlay-capable device, such as the iPhone, iPad, Apple Watch, MacBook, etc., without a network connection or router. If the user does not have an AirPlay device, E-Clip also uses Bluetooth connectivity, so they are able to choose the way they stream their music. 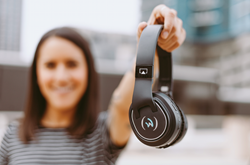 The E-Clip headphones allow for 10 hours of crisp, clear playtime when using Wi-Fi and have Bluetooth capabilities as well that can last for up to 50 hours of playtime. They can easily charge in just two hours, and the headphones are equipped with infinity range, allowing users to roam outside of the Wi-Fi range of their device for up to 10 minutes without losing high-fidelity audio. E-Clip headphones are portable and fold down into a case to make traveling easy, while their ergonomic shape makes it comfortable to be worn for long periods of time. E-Clip is currently being offered exclusively on Kickstarter. Early adopters can pre-order a pair of headphones for $159 (MSRP $225). For more information, visit bit.ly/e-clipks. One-E-Way, Inc., established in 2004, is an electronic product design and manufacturing company with offices in Pasadena, CA. Their goal is to provide innovative, convenient and affordable consumer electronic products in the domestic and international market. They want to expand the One-E-Way brand with the objective of becoming a major participant in the wireless industry, targeting cross-platform wireless business opportunities. Visit http://www.one-e-way.com for more information.